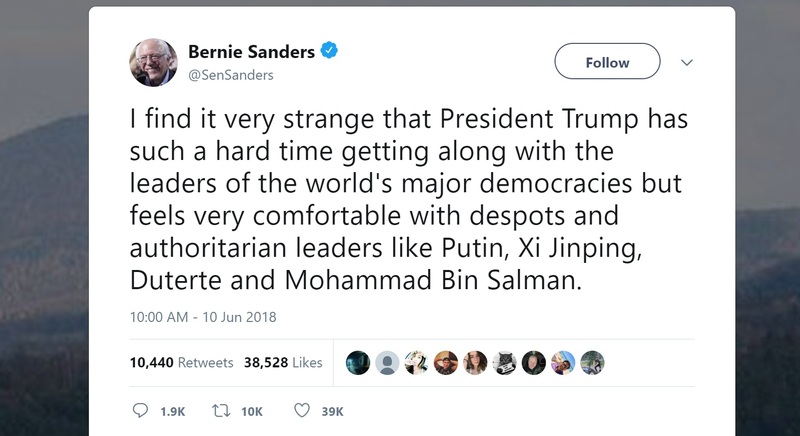 Sen. Bernie Sanders (I-Vt.) questioned the nature of President Trump’s relationships with various world leaders, saying he found it strange that Trump had difficulty “getting along” with U.S. allies, but was “comfortable” working with authoritarian leaders. Sanders’s tweet followed a tense weekend between Trump and members of the Group of Seven (G-7) at the group’s summit in Canada. During a Saturday press conference, a reporter pressed Trump on his relationship with his G-7 counterparts. “The level of relationship is a 10. Angela [Merkel], Emmanuel [Macron], Justin [Trudeau]. I would say the relationship is a 10,” Trump responded, before departing for a planned summit with North Korean leader Kim Jong Un in Singapore. But, shortly after Canadian Prime Minister Justin Trudeau announced that all G-7 members had signed on to a joint communique at the summit’s conclusion, as is customary, Trump blasted the Canadian leader while en route to Singapore, saying that the U.S. would not endorse the joint statement signed with the other G-7 members, breaking with long-standing tradition. “Based on Justin’s false statements at his news conference, and the fact that Canada is charging massive Tariffs to our U.S. farmers, workers and companies, I have instructed our U.S. Reps not to endorse the Communique as we look at Tariffs on automobiles flooding the U.S. Market!” Trump said in a tweet.